Elephants produce a rumbling alarm call that warns of the threat of approaching bees, scientists have found. The researchers also discovered that the elephants retreated when a recording of the call was played - even when there were no bees nearby. The study was led by Lucy King of the University of Oxford and the charity Save the Elephants. She believes that such calls may be an "emotional response" to a threat and a way to co-ordinate group movements. Ms King explained: "We discovered elephants not only flee from the buzzing sound, but make a unique rumbling call, as well as shaking their heads." Despite their immense size and thick hides, elephants are afraid of bees. Adults can be stung around their eyes or inside their trunks, whilst calves could potentially be killed by a swarm of stinging bees as they have yet to develop a thick protective skin. The discovery, reported in the journal Plos One, was part of an ongoing project in Kenya, which aims to reduce conflict between elephants and farmers. As agriculture expands in Kenya, elephants are forced into smaller and smaller ranges, and the animals often enter the farms that are now in areas where they once roamed. "Farmers will do anything to keep their crops and families safe from damage, and unfortunately records of shootings, spearings and poisonings of elephants are on the increase," Ms King wrote on the University of Oxford's website. "Our project work is trying to come up with a low-tech deterrent method that will not only keep elephants away from fields of crops, but will also enhance the income of farmers through the sale of bee products." 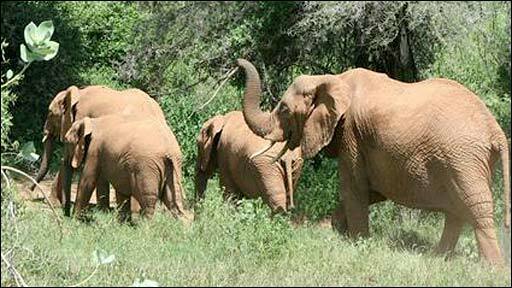 Such a recording could prove a useful and humane elephant deterrent, the team said.